returns to the magical Interlagos circuit, Sao Paulo, Brazil. It was a fast and furious start to last year's race. 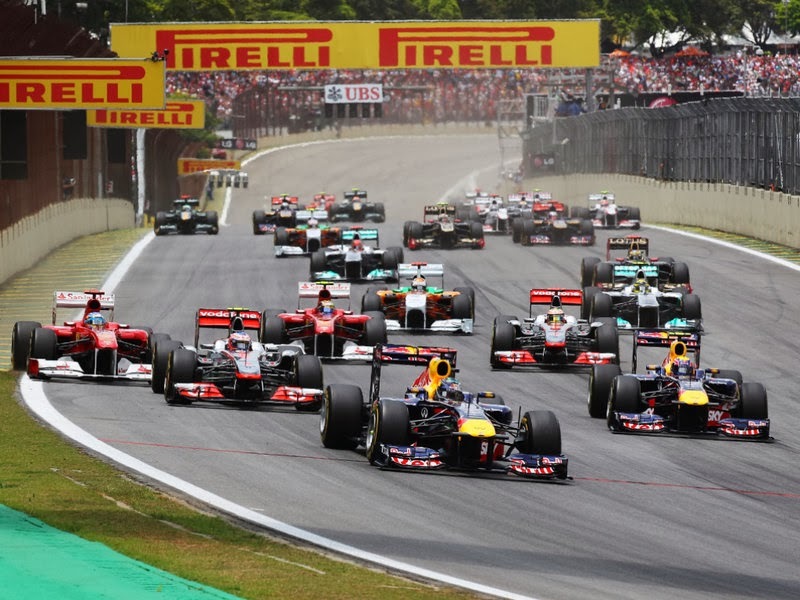 For me the Brazilian Grand Prix is one of the highlights of the season. So many great races down the years, so many dramatic wins, this has been the venue for many championship deciding races. The Brazilian fans make for a special atmosphere too and are fiercely patriotic! The circuit itself lies in a district of Sao Paulo called Interlagos , meaning `between the lakes`. The Brazilian Grand Prix was first held in 1972 here on the bumpy and very demanding longer circuit. The first GP to be included in the F1 World Championship was held the following year and won by defending champion and Sao Paulo resident Emerson Fittipaldi, a very popular win. The circuit was revised for the 1990 season. It was modernised and shortened in length but still retained its demanding nature. That year saw Alain Prost win, his sixth Brazilian Grand Prix win and one of the most unpopular due to his coming together the previous year with the fans hero Ayrton Senna in Japan. He later complained to the stewards after the race and Senna was stripped of the win that cost him a World Championship. Senna himself had mixed fortunes in his home Grand Prix. He tried many times to win but something would always happen to prevent him from doing so. That all changed in 1991. In one of the most amazing and emotional races, Senna eventually took the chequered flag after nursing his McLaren round with his car stuck in sixth gear! He was so exhausted afterwards he had to be helped out of his car by doctors. Probably one of the most celebrated home wins by any driver ever! In 2005 Fernando Alonso became the youngest World Champion by finishing 3rd giving him enough points to take the title that year. Just three years later Lewis Hamilton won in dramatic fashion to replace Fernando Alonso as the youngest World Champion! He went for a cautious race strategy needing only 5th place to secure the Championship. Late on in the race it started to rain causing all sorts of trouble for the drivers. Lewis dropped to 5th after Timo Glock stayed out on intermediate tyres and with 3 laps left Lewis was caught and passed by Sebastian Vettel to drop to 6th. However on the last lap both Vettel and Hamilton caught up with Glock who had little grip left and Lewis passed the German on the very last corner before the finishing straight to deny race winner Felipe Massa the Championship win! Still recovering from that unforgettable night in Brazil even now! The race on Sunday will be 71 laps in total on the 2.7 mile track. My favourite part of the circuit without a doubt would be the Senna `S` which is the first S shape corner after the start finish straight. Named after Ayrton Senna as he had a hand in its design for the 1990 season. Normally a few shunts there at the start! So who will win? Come on, you know the answer to that! Its always a spectacular way to end the F1 season, bring on Sunday as the F1 2013 season culminates in Brazil.